The Forex market is short for “foreign exchange market”. It is also known as FX or currency market. It is just what it sounds like – the selling of one currency in order to buy another currency. 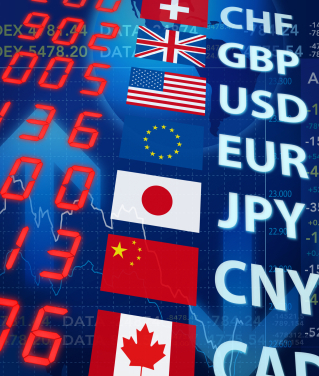 The foreign exchange market is how travellers exchange money when visiting another country. It is also how global corporations cover their expenses and payroll for the countries they have operations in. Currency from one country is converted to the currency of another country, based on the current exchange rate. However aside from the strictly functional purpose of Forex, there is also currency trading, where the goal is to purchase currency and then sell it for a profit – known as Forex trading. Roughly 5% of the daily volume is for foreign trade from straight currency exchange. This is being done by companies, banks, or individuals. The other 95% is trading for profit. When it comes to trading for profit on the Forex market the volume of the trading centres around the major currency pairs. The major currencies are the most widely traded because they are the most liquid. These are the US Dollar, the Euro, the British Pound, the Japanese Yen, the Swiss Franc, the Australian Dollar and the Canadian Dollar. Because Forex is the exchange of one currency for another, it is traded in pairs, with one-half of the pair being the currency that is being bought and the other half of the pair being the currency that is being sold. An example would be trading the US dollar for the Japanese yen. So this pair would be referred to as USD/JPY. Trading on the Forex market is different from trading on the stock market for a variety of reasons. The biggest difference is that instead of set trading hours like the traditional stock market, trading on the Forex market is allowed five days a week. For those five days, the Forex market is open 24 hours, round the clock. The other major difference is that there is no central exchange for Forex. It is all handled electronically or over the phone between the two parties involved. For smaller traders this usually means via a bank or brokerage firm who deal directly with the “counter party”. The counter party may be another institution or indeed another small trader acting via such an institution. There is no regulation of the Forex market by the U.S. Securities and Exchange Commission. Thanks to technology the market is easily available to nearly everyone who wishes to trade it. So trading on the currency market can be done by individuals, brokers and dealers, banks, companies, insurance companies and indeed any entity that has a need to buy or sell currency.